Does The Watchtower Endorse Spirit Mediums? If you ask a Jehovah's Witness today what he thinks about the occult and spiritism, you're bound to get a negative response. After all, the April 1,2000 issue of The Watchtower and the July 22,2000 issue of Awake strongly warn its readers about the dangers of these demonic practices. They even quote Deuteronomy 18:10-12 proving that consulting spirit mediums, fortunetellers or channelers is detestable to Jehovah. However, does the Watchtower always practice what they preach? 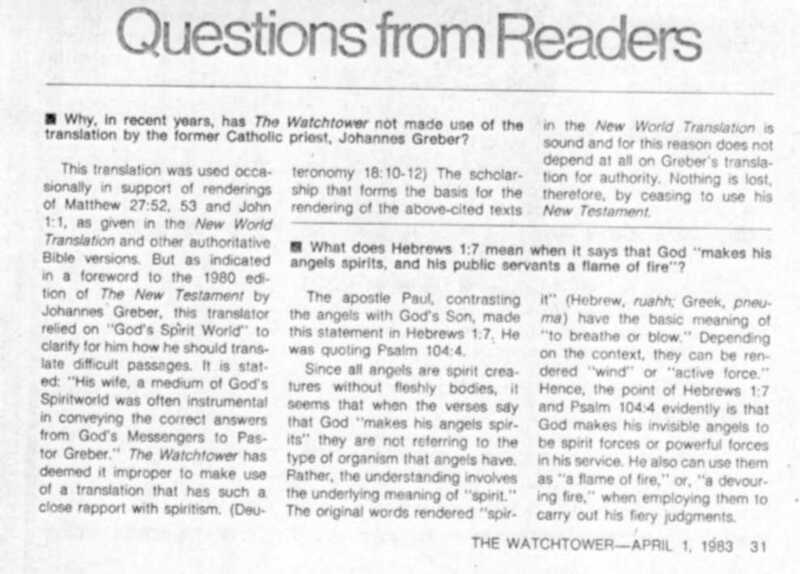 Lets go back to the April 1, 1983 edition of The Watchtower. In the Questions from Readers section, someone asked, "Why in recent years, has The Watchtower not made use of the [bible] translation by the former Catholic priest, Johannes Greber?" The answer in a nutshell is that when the Society found out by reading the foreword of Johannes Greber's 1980 edition of his New Testament, that he was a spirit medium, they stopped using his translation for support. You see, for 14 years the Watchtower used Greber's New Testament translation to give credence to their own peculiar New World Translation. Particularly John 1:1, which is basically identical in both translations. 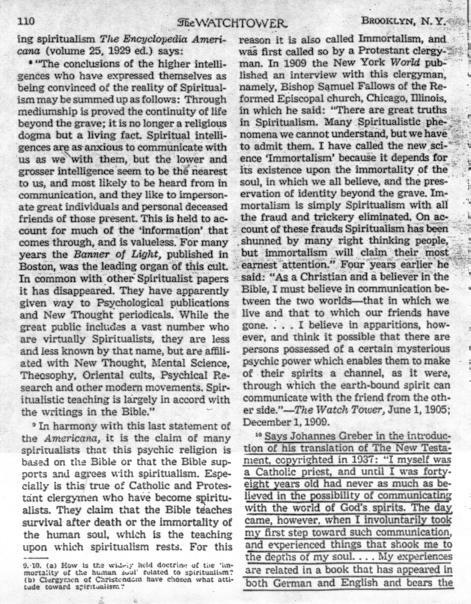 The fact is, however, that the Watchtower Society knew that Johannes Greber was a spirit medium way before they read it in the foreword of his 1980 translation. They already knew this after reading the foreword of his 1937 edition. This can be verified by reading the February 15, 1956 edition of The Watchtower, pages 110 and 111. Here, they exposed Johannes Greber as a spiritist and author of the book, "Communication With the Spirit World: Its Laws and Its Purpose". 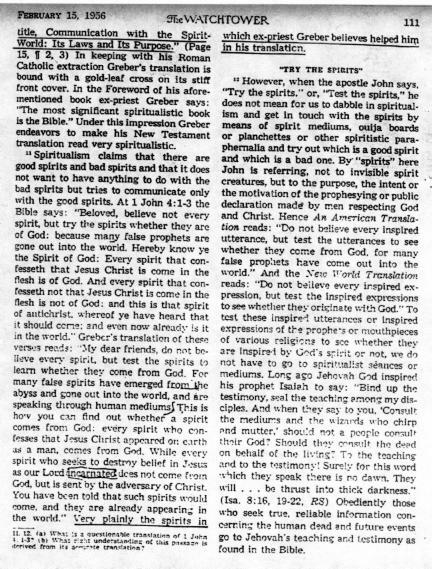 They also warned their readers that the spirits that helped Greber translate his New Testament are of antichrist. It is interesting that Greber's translation also renders the Word as "a god" in John 1:1. Why do the Watchtower and spirit mediums have a common interest in calling Jesus "a god" and not "God", as do all versions that are translated by recognized Greek scholars? Why did the Watchtower use this demonic translation for support in the first place since Deuteronomy 18:10-12 is clear in forbidding all contact with the occult? Couldn't they have used a recognized authority and not a spiritist for support? Obviously, the spirits that helped Greber cannot be trusted. Furthermore, if the Watchtower is correct in calling Jesus "a god", why in John 5:23 does Jesus demand that all honor the Son, just as they honor the Father? Why would a created being demand the same honor as the Creator receives? And why did Jesus say in John 15:26, that when the Spirit of truth comes from the Father, that one will bear witness of Himself and not Jehovah? The wrong answer to these questions will result in everlasting judgment. We here at Tower To Truth want you to choose the right answer which leads to everlasting life. Please, put your eternal salvation into the hands of Jesus Christ. For there is no other name under heaven by which we are saved (Acts 4:12). Clearly, the Watchtower Society is not God's organization. It has deceived, lied to and misdirected many honest, God-fearing people since its inception in 1879. Don't stand before God as a Jehovah's Witness. Stand before Him as a Witness of Jesus (Acts 1:8). For he that confesses the Son has the Father also, but everyone who denies the Son does not have the Father either (1 John 2:23, Matthew 10:40, John 12:44-45).